Having grown up on Vancouver Island, recreation was always a part of my daily life. Throughout my late teens and early 20s, many of my friends were involved in the local skateboard scene, landing ollies on our city sidewalks and grinding rails at the community bank. Vancouver Island has become home to a large number of skateboard parks over the last decade as municipalities are recognizing that it’s an important part of youth culture. In fact, a comprehensive list of the Island’s skate parks can be found online. While skateboarding has largely been seen as a nuisance by many, I wanted to take some time to dispel a few of those myths. Through the convenience of technology, I was able to sit down with Shawn and Davej – two veteran skateboard enthusiasts who were instrumental in developing one of the Island’s biggest private skateboard parks. It’s a lengthy read but very fascinating! Keira: How do skate parks benefit our communities? Shawn: Providing a safe and useful location for skaters to do what they are already doing makes sense to me. A city or government that supports positive youth involvement is going to connect with the younger demographic… and their parents. Davej: And recognizing and supporting alternative forms of sport and physical activity and the citizens who participate in them is a good way to build community. Keira: What helped skateboarding become more socially accepted in our communities? Davej: Skate boarding has had a roller-coaster history in North America. On the West Coast in the ’70s tons of kids were skating – almost as many girls as guys – but at the end of the decade a public wave of fear led to the demolition of many concrete parks. Skating made a comeback in the ’80s but by the the end of the ’80s it was almost non-existent as far as society was concerned. For more than a decade now I think the sport and the industry have made steady progress, even making major inroads to the mainstream consciousness. Shawn: Wide-spread positive feedback for the past ten years has really helped the recent skate park movement. Davej: And it’s good to see the girls back and ripping! Keira: Why is being involved in the skateboard culture something you both enjoy? Davej: For me, the possibilities in skateboarding are endless because it is so challenging. You can always try variations and forever improve stuff. I think skateboarders look at the world in a more creative way, always wondering what more could be done with a particular object beyond its original intent… it’s a real spacial-visual intelligence exercise. Shawn: I think skateboard culture has always recognized that supporting the next generation of riders is part of the natural flow. I want to see kids continue having fun. Keira: What do you think is the biggest misconception about skate parks and the culture? Shawn: A common misconception is that skate parks are too expensive for a small town. Or that they will cause a mess. Some of opponents of skate park development argue they are only for a small demographic, but I think they are for the whole family. In the mornings you often see little kids and parents hanging out; after school and in the evenings the older crowd gathers. Davej: From a design point of view, building a skate park is more about the small details than the big picture. I have seen too many parks ruined by seemingly minor omissions of a contractor or designer who doesn’t really specialize in creating skate parks. Keira: What should the general public know about skate parks? Davej: I think there is always the tendency to fall prey to unwarranted “dangerism” and hold the view that a skate park is an extremely risky place, but the statistics are pretty clear that other sports such as basketball and soccer have a much higher level of injury than skateboarding. Having proper skate education, using proper park etiquette and beginning at a young age can make skateboarding one of the most fun and beneficial physical past times for young people. I am proud that the West Coast has always been a leading example in supporting skateboarders. Shawn: A good skate park is a long term solution for future youth. Keira: How would you like to see skate park culture evolve in the next few years? Decades? Davej: I am really stoked about the skatespot style that is getting more press recently. Instead of a monolithic mass of skate-dedicated concrete in one corner of the town, several smaller skate-friendly spots and plazas are built in parks and public locations. When the skaters are not around, the plaza or spot blends in as part of a well-designed and attractive public space. Core companies like Newline are rocking this concept right now. Shawn: I would like to see more small towns in Canada’s Prairies invest in well-designed and constructed skate parks. If a town wants to cut corners by hiring non-skate specialized contractors, they should at least build next to old skate parks instead of replacing them. Don’t tear down old parks that work. Vic West is a great example of this. The next decade? Keep supporting skate parks as the culture grows and progresses. Davej: As far as the next decade, it is hard to say. In the past the industry has tended to drive one particular style of skating at a time (pool in the ’70s, vert in the ’80s, street in the ’90s) but I think more skaters are beginning to own the idea that any kind of skating is cool and fun. Keira: Is there anything else you feel is important and worth mentioning? Davej: Many of the towns on the Island have supported the development of really great skate parks in the last ten years. The Island is now a great skate destination with a park almost every ten or twenty minutes up the Island Highway! And I can’t stress enough the importance of getting the right people to look after the details when you are pouring a slab of concrete that will be part of your community legacy for the next thirty years. Shawn: Towns need to realize that when a group of twelve to seventeen year-old kids spend time and effort to raise money and go to public meetings to develop a skate park, they are emerging as future leaders, and we need to encourage rather than discourage them. Shawn is co-founder of The Crew and has worked with youth skateboard organizations in the U.S.A. and Canada for over a decade. Originally a native of BC, he is currently living and working in Alberta. Davej is a developer and freelance artist currently residing in Kansai, Japan. As co-owner of Project Skates, he has designed and built ramps for camps and school skate programs in Canada, the USA and Japan. I will draw one lucky winner on Monday, November 15th! What aq great contest. I would love to win this!!! nice work on the article, keira-anne. rock on..peace and love from the land of j^pan. I used to skate when I lived on the island. Had myself a Mike McGill deck! At Sir James Douglas there was a 1/4pipe that we could use at lunch time. My question to the above guys, do they shred in the winter when there is no concrete to skate on? well rounded article, like ange i too remember dave teaching me skate tips. hahaha when he lived under the halfpipe! haha such a dream world. hope i win a sweet deck!!! p.s. see you soon for the santa parade!!! i agree. skateboard parks can be a great way for youth (and the young-at-heart) to be physically active and build a healthier community. I agree with Shawn that a good skate park is a long term solution for future youth … there’s a lot worse things our youth could be doing than staying active and being physically creative! The risk of inactivity outweight the risks of skateboarding, cycling and every other sport out there. As a single father of two boys that love to skate and an old skater myself I’m very pleased with the skate scene on the island. We are always out at the parks throughout town… we do a tour from one park to another… from Sidney to Sooke and all the ones in between. What a fantastic article! It brings up so many great points for positive discussion. It also makes many positive arguements for communities like the one I live in, that seem to protest an outdoor skatepark, on why it is so benificial to have a venue like this for kids, youth and adults alike. A skatepark brings together old and young, the veterans and the beginners and all that are inbetween. They work together teaching, modeling and encouraging one another. New friends are formed with skateboarding as the common element. As a parent of a couple skateboarding youth I LOVE to sit at the skatepark and watch as the action. Shawns point “A city or government that supports positive youth involvement is going to connect with the younger demographic… and their parents.” AMAZING INSIGHT! Pingback: Vancouver Island Blog – Keira-Anne.com » Blog Archive » Could Vancouver Island Be Home To Kraft Hockeyville 2011? Oooooh! My son would love one! AND I move to the Island in 27 days! AND there is a sweet skate park in Sooke my son is dying to go to! 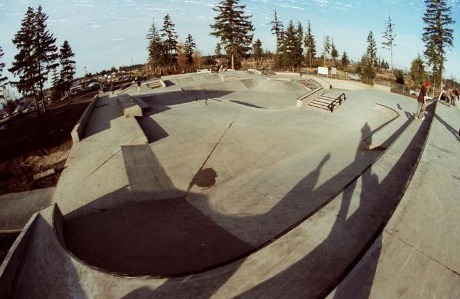 Ah the old Courtenay skatepark – I used to spend a lot of time there. I am pretty sure there are still bits of my teeth, skin and blood on the concrete there. The new park looks great – I wish it was around when I was a kid!